To keep your canopy in the best shape possible make a habit of cleaning it on a regular basis. Cleaning can be a simple task once you know the basic steps in the process. 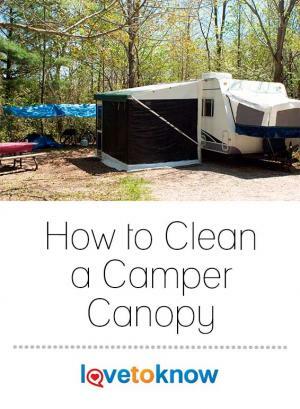 Just like with most items for camping, the camper canopy needs to be cleaned regularly in order to make it last as long as you own your camper. Many people decide to clean the canopy at the end of the season while others do it more regularly. Depending on the weather conditions and where you park your camper, cleaning will depend on various factors. If you only use the canopy a few times a year, cleaning at the end of the season may suffice. For those who use it every weekend, continuing to clean on a regular schedule is a must. Choose a shaded area that is free of debris and accessible to a water supply. Begin cleaning by hosing the canopy down with water to remove any loose dirt and leaves. Fill a bucket with water and a small amount of dish soap. Around two tablespoons of soap is usually enough to clean a canopy. Using a soft brush, begin scrubbing the canopy with the soapy water until the entire area is covered with soap. Rinse the canopy with the hose until there are no visible suds. Often a simple cleaning with soap and water is just not enough to get your canopy clean. If this is the case, there are several things to try out to get your canopy looking like new. One thing that can be difficult to clean from a canopy is tree sap. If you park your camper under trees, this is likely to be the result. Tree sap can be cleaned from a camper by using the ice cube method. Place ice cubes on the area where tree sap is present, then once they adhere to the spot, gently begin chipping them off. Be careful not the ruin the finish on the canopy. For stubborn stains such as grease, try a commercial cleaner made for your type of canopy. Canopies come in various materials such as acrylic or canvas and many are treated with fabric protection. Never use harsh chemicals or bleach to clean your camper canopy since they can affect the fabric's durability and lead to damage. It is important to know the type of canopy you have and to always follow manufacturer instructions. 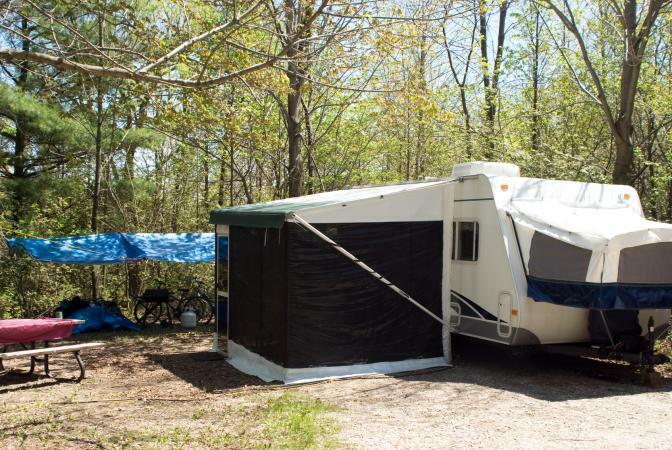 Keeping your camper canopy clean throughout the season is a way to ensure it stays in great condition. If you clean it before storing it away and make sure it is completely dry, mold and mildew are less likely to grow. Try to inspect your canopy after each use so you are aware of any stains or dirt build up. If you notice any tough stains, treat them immediately. The longer they set into the fabric, the more difficult they are to clean. By maintaining your canopy and making sure it is clean, you will be able to enjoy years of use. Canopies can last as long as your camper if you take care of them properly and keep them free of accumulated dirt and debris.